AN INTEGRATED golf resort in Langkawi, premium shopping outlets on mainland Penang along with the scaling up and strengthening of padi farming in irrigated areas are part of 26 entry point projects (EPPs) which have been identified by the Northern Corridor Implementation Authority (NCIA) for the northern region from 2012 and beyond. The authority's chief executive Datuk Redza Rafiq told Business Times the EPPs, which are projected to generate some RM17.46 billion in gross national income (GNI), will also include the creation of a central automotive logistics hub in the port area to support automotive players like Naza and Sime Darby and their export markets. "We want to bring up the tourism and logistics sectors to the same momentum as we have done so far with manufacturing and agriculture," he said in an interview. In developing premium shopping outlets on mainland Penang and introducing unique retail concepts, Redza noted that that it will involve RM736 million in private sector funding and see the creation of 5,418 jobs. 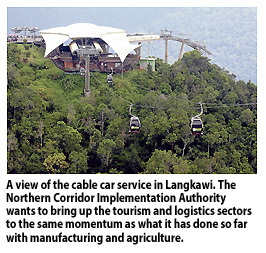 "In developing a northern cluster 'Straits Riviera'," he added, "enablers to facilitate greater cruise arrivals into Langkawi and Penang will be developed. "This will involve the revitalisation of a 2km radius of the areas of the respective ports." While the federal government will provide RM15 million in funding for this initiative, private funding will see RM169 million ploughed into it, and this expected to see some 3,671 jobs created. Also on the drawing board in giving tourism development a boost are dedicated entertainment zones in conducive areas in Penang and Langkawi, where the private sector will invest RM371 million. "The government will also plough in an estimated RM52 million for the development of two new convention centres, events development and the establishment of a meetings, incentives, conventions and exhibitions bureau in Penang," Redza said, adding that shell sites will also be established for incentive events. 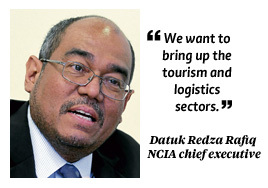 In uplifting the northern region's logistics sector, Redza said the proposed "One Auto Hub" will involve RM770 milluion in private funding. "Our aim is to attract the small- and medium-sized players who have been squeezed out from Thailand's Rayong Province which serves as centres for the auto and chemical industries," he added. Out of the 26 EPPs, about RM6.6 billion investments will involve 13 city initiatives to improve public transport, provide affordable quality housing, maintain green spaces and waste management. A total of 70,565 new jobs are also expected to be created from the 26 EPPs.